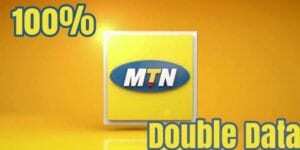 Mtn double data is blocked! Mtn double data aren’t working again? Is mtn not doubling data again? Why didn’t i get double data from mtn again? The above have been the response / questions i have been receiving all this while which am finally here to give you all the answer. The answer to the above questions is NO! Mtn double data is still active and working smoothly just that you need to reactivate yours if you have been using it before and find out you aren’t getting double data again. If you haven’t yet partake in the offer, now is also a chance for you to join the trend as its recommended as if not the cheapest sub at the moment. Oh yeah! Am once a victim with the automatic terminating of me receiving double data from mtn. I decide to dump the SIM till i later try reactivating it which work out successful. Before i proceed, let me say a big shout out to my fellow bloggers who introduced buying of new SIM which also works 100%. The step am about to show you now doesn’t matter if you are using old or new SIM rather all it needs is your understanding. Now head straight to your phone SMS and send the following accordingly. After all the above procedures have been done successfully, you are now good to go. Subscribe any amount you feel like ( your pocket can carry lol.). To check data balance, kindly SMS 2 to 131 and your data balance will be sent to you + your bonus data. Enjoy ?.